Woke up pretty early, well before sunrise. Either nerves, or the lazy day yesterday, my body and mind were ready to go. Packed up quickly due to all the damn biting insects, said good morning to the other hiker, and took off down the dunes. Excited to see the sunrise, I was fooled by some devastating looking storm clouds on the horizon. Luckily enough there was a portable toilet just off trail on the road (a handicapped one at that, so much space! ), so I hopped in and did my thing while the storm rolled through. As the rain came began to stop, someone beat on the door of the unit I was in. Turned out the other hiker wasn't as lucky and got caught in the rain, and wanted to use it as well. We exchanged places, and soon thereafter hiked off towards the end together. A few hours later we were in Pensacola Beach and decided to stop for breakfast at a cool little cafe. We felt a little bad because we were both soaking wet from the rainstorm that hit us on and off throughout the morning, but the waitress assured us that most kids are way worse than a few wet hikers. Drank some coffee, ate our delicious breakfasts, and lightly resupplied for the day, continued on our way. Sky broke and remained sunny for the rest of the afternoon. Finished up the last couple of miles floating on a cloud, the way one does at the end of a long journey. More beach walking, and pristinely groomed trails as we entered Fort Pickens, paid our entry fee, and finished strong. As we arrived at the monument the other hooped and hollered, scaring the hell out of an older woman who was watching a turtle off a small bridge. She was immediately excited for us and everyone began asking their twenty questions all at once. We chatted for a few minutes with them, took our "summit photos" and walked the last few steps to the parking lot. Ended up getting a hitch out of the park pretty quick, a nice couple from Wisconsin. Shortly thereafter I was digging through a garbage can looking for some cardboard, using the sharpie that I carried all trail (and never used!) to make a sign to try and flag down another hitch. Managed to get a hitch super quick into Pensacola, a huge surprise since hitching has been notoriously difficult the entire trail. Lucky for us, the driver was heading within a mile of our Airbnb rental, which worked out perfectly. A little early for our scheduled check in time, we grabbed some food, enjoyed our last indulgent trail meal of entirely too much Taco Bell, and slowly walked the mile to our rental. With no laundry onsite and the both of us hack auite a bit of time on public transportation conveyances very soon, we walked across the street to a thrift store and purchased ourselves some new digs. Heaven help the TSA agents that randomly search our bags when they encounter our unwashed trail clothes! 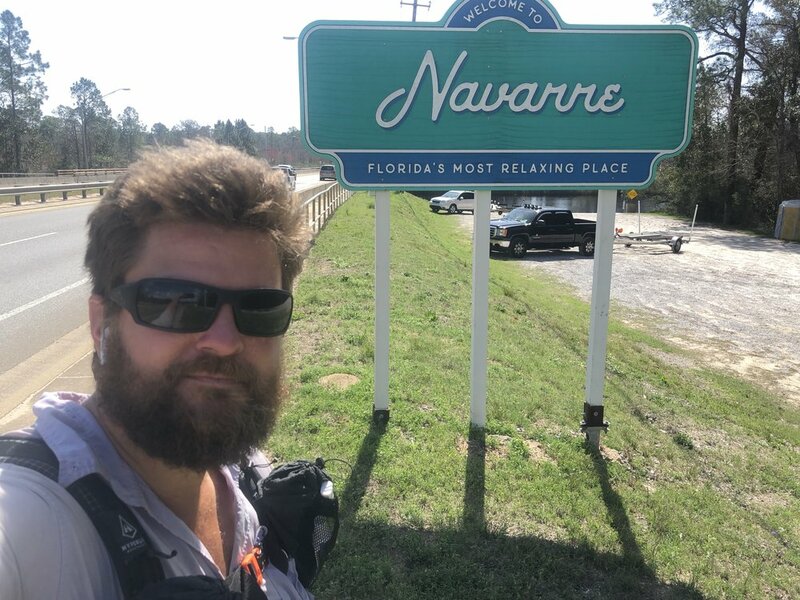 In time I'll post a summary of the trail, my thoughts, feelings, statistics for future hikers, and overall experience of hiking the Florida National Scenic Trail - but for now, rest, travel home, and contemplation are in order. Woke up at the fire station, slowly packed up. No rush since the end is near. Walked out of the town of Naverre Beach and onto National Parks Land, the Gulf Islands National Seashore, Santa Rosa Area. Trail lead off the road onto the beach, and it was pretty fantastic. What a way to end a hike. Kicked off my boots, threw them atop my pack, and walked barefoot for a couple of miles in the surf. The Florida Trail is apparently the only national scenic trail that walks on a beach, and it was a pretty unique experience to do so. Took advantage of it and went for a swim to cool off since the sun was beating down even though it was still early morning. Arrived at Opal Beach and took advantage of the outdoor showers, cleaning my hiking clothes and cooling off once more. Sat under a roofed picnic area and dried off, eating some rehydrated instant rice and soy sauce. Just as I was packing up to leave, a huge bank of clouds rolled in. Out of nowhere, the wind gusted, sandblasted me in the face, and threw me and all my stuff off the picnic table. It was pretty intense. With miles to do, I hiked off into the storm. While it only lasted around twenty minutes, the wind was incredibly strong and the rain soaked me through. Just as quickly as it arrived, it was gone, and I was walking once again in beautiful bright sunlight. Trail cut from the beach into dunes on the other side of the sound by the bay, and I walked until just after 1300, arriving at the only campsite between Eglin and the northern terminus. Even though it was pretty early, I stopped for the day and set up my tent. I don't usually stop and just relax, so it was a change of pace. It was very warm in my tent because of all the sun and lack of wind in the small grove of trees I set up in, but the biting sand flies were particularly bad so I chose the tent. Crashed for a short nap in the heat, waking up to another hiker showing up. Same guy I walked all day with a week ago, he decided to take a short day as well and head to the terminus tomorrow. We chatted as he set up for the night, talking about all the things that begin to creep back into your head after a long hike. Life, happiness, finding meaning, etc. Lying in my tent listening to the wind and crashing waves. One more day. Up with the sun, no rush to get moving. Called the wife and chatted as I packed up my things. Doing my best to slow it down as I near the end, mainly for logistical reasons since my flight isn't for a few more days, but also because mentally it's tough to transition from backpacking to the real world. Easy morning, finished up the last segment of trail on Eglin. Can't say too many nice things about this part of the base, seems to be some sort of borderlands between the heavily used portions of the base and the world at large. Loads of trash, abandoned appliances, and other detritus scattered on abe around the trail. Popped out around noon on the road leading to and through Navarre. 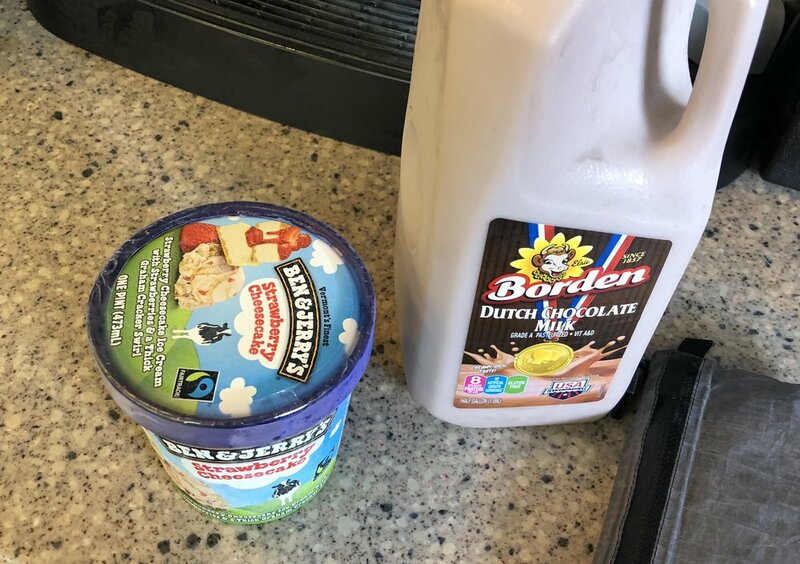 Grabbed some snacks and drinks at a convenience store and powered on, stopping at a Publix to grab my last resupply of the trail. Rest of the afternoon was spent walking up and over a big automobile bridge to the town of Navarre Beach, located on a thin strip of land with the Gulf of Mexico on one side and a large bay on the other. Stopped early in the evening and was lucky enough to be provided a place to camp behind the local fire rescue station. Was planning on pushing to the next campsite twelve miles away, but realized that I wasn't going to make it in a sensible amount of time, especially because many of those miles are in sand and dunes. Set up my stuff, walked to a local restaurant, charged my electronics and grabbed a bite to eat. Probably going to take a short day tomorrow and head to that twelve mile campsite, if only to continue to kill some time before my flight. Slept in a little by this morning. No rush to get to the end with my plane ticket being a few days out. Packed up quickly, sat and talked as the two dudes who camped last night packed up their things. Polished off the rest of that pizza I carried out from town last night. Hiked with them for an hour or two until we arrived at a stream that required us to walk through. They started taking off their shoes to cross so I bid them adieu, tromped through, filled up my water and continued on. Long morning of walking through unmaintained trail. Tons of spider webs across the trail as well, which slowed me down a bit. Arrived at the junction around mid day that heads north to the Alabama border. Had half a mind to turn north and hike towards Springer Mountain and just hit the AT for another thru. Arrived at a little gas station early in the afternoon. Plugged my phone in, slammed a Gatorade, foraged around the store for some treats. Settled on six Krispy Kreme's, a microwave burrito, and half a gallon of chocolate milk. Sat on the curb outside with my shoes and socks off feasting and airing out my feet. Finished off the day with a road walk and a bit of the portion of the trail in west Eglin. Managed to find a stealth spot between campsites, a no no but the previous site was closed and very close to the road. Town tomorrow for my last resupply, then the terminus shortly thereafter. Slept pretty well last night, another exhausting day. Woke and packed, sat and chatted with the trail angel for a bit before heading out. Long day of road walking today. Entire day on roads through the town of Crestview and Holt. Grazed throughout the day on Whataburger, Starbucks, and had lunch with the trail angel at the Waffle House before leaving the city limits. Traffic was pretty bad all day. Got increasingly stressed it frustrated with car after car and so much road noise. Stopped for some fried chicken at a little restaurant in Holt, resupplied at the Dollar General, and walked off down a country road into the darkness. Loads of dogs out tonight, was chased by a few and had to use a combination of my voice, emergency whistle, and trekking poles to fend them off. Almost got ran over by a pickup truck as well, which added to the stress of the day. Early start today, had miles to make. Woke up before sunrise, packed up, chatted with the two local trail angels before heading out. Beautiful section, very reminiscent of the AT. Still very Florida, but add in a few gently rolling hills with stereotypical dips down into streams and back up and out the other side. Didn't stop much today overall. Had very little food left from my last resupply, most of it being dinner style rehydration food. Ate a Talenti container full of rice for breakfast and lunch, and two packets of ramen for late lunch and early dinner. Decided about half way into the day to reach out and take the two trail angels up on their offer of providing me a place to stay for the night. Gave me some incentive to get a move on. Hot food, a shower, and a bed will do that to you sometimes. Afternoon was more pristine trail through the base. No issues like yesterday gettting caught in a burn area or restricted areas. Managed to get to the trailhead linkup point right on time, my ride pulling in a mere minute after I arrived. Angel drove me through town back to their place, where we picked up another passenger and went off to dinner. Had an amazingly big and tasty bacon cheese burger with fries, and sweet tea for days. Good discussion and shop talk about hiking, gear, and future plans. Arrived back at the house and continued the conversation well into the evening before everyone started yawning uncontrollably and we all called it a night. Full day of road walking tomorrow. Plenty of restaurants and fast food joints though, so some grazing is most definitely in order. Slept in this morning, no alarm and woke up with the sun. Packed up and walked the few miles to the border of Elgin Air Force base. Great hiking overall. Terrain is very reminiscent of the southern portion of the Appalachian Trail, if only a bit more moderate in the relief department. Got caught in a controlled burn in the afternoon. The base provides daily updates for closures, but this particular closure wasn't on the last issuance. Fire got pretty close and was surrounding me, so the only choice I had was to hike on and figure it out. Turned out alright, but could have been very bad. If the winds would have shifted in my direction and the fire turned, I'm not sure what I would have done. Definitely an experience I don't want to relive. Hit the highest point in the Florida today, a whopping 271 feet. I keep imagining myself back out west at 10,000 feet and the contrast is incredible. Met up with some local trail angels who are out for an overnight trip. They happened to be camping near where my day ended, so we hung out around camp and chatted for a while. They live a town over and the trail walks near their house, so they offered me up a room for the night when I'm passing through. One hundred miles to go. Slept like a rock last night. Didn't get to sleep until around midnight, but I didn't wake or stir until the morning, which doesn't happen very often. Guess I was exhausted. Puttered around the motel room chatting with the wife on the phone, slowly picking up my things and packing up. Did a bit of math, checked prices online, bought a plane ticket home out of Pensacola, FL. Prices pushed the ticket out 2-3 days later than my hiking would get me there, but the price difference was worth it. Looks like I'll be taking it a bit slower, which probably won't be a welcome change but it can't be helped at this point. Stopped at the gas station next to the motel and grabbed half a gallon of chocolate milk and two foot long sandwiches for the road. Turns out that some of the local rivers are above flood stage, so quite a bit of trail is unsafely underwater. Ended up spending the whole day on busy roads, the end of the day being on an actual divided highway. Luckily there is a construction project going on so the standoff from oncoming traffic was pretty reasonable. Walked a short distance off the road walk to a Publix grocery store and grabbed provisions for the next two days. Still have food from my previous resupply, so it was pretty quick. Charged up my phone out front while I ate some sushi and rice pudding. Hiked out into the sunset, continuing on well after dark. Arrived at where the trail connects and leads along the border of the Elgin Air Force base, tucking myself into the trees after finding a flat spot for the night. Another alarm morning, out with the sun. Appeal is growing on me, and as long as I've got the energy on certain days I think it's the way to go. Walked for the morning on water management district land. Interestingly enough the water management districts seem to own a lot of land, seemingly for both water purity and conservation efforts as well as management of weather-related water occurrences. In a nut, it means they own a lot of pristine land that the public is allowed to recreate on. At the border of the WMD recreation area was more pristine forest land that has recently been clear cut. Trail used to go through said land but now is a wasteland of rubble and roots. Walked for the large part of the rest of the day on roads. Temperature reached above 85 and the sky was cloudless. Not the best road walking conditions but I'll take hot blazing sun over rain any day. Stopped at a gas station just after noon for some refreshments and to top off my water. Slammed a Gatorade, bought some fried chicken and sweet tea, filled up my water and packed out a second Gatorade to help beat the heat. Reentered the woods near the end of the day. The evidence of the last few days of rain is everywhere. Brush and grasses are still flattened down well beyond the water sources that overflowed, debris is piled up around the base of trees and bushes, and many of the water bodies are still very full. Ended up having to ford/swim a large stream at the end of the day today, which was unexpected. Decided to spent the night at a motel in Ebro, a short distance from the trail. Since I was soaked I didn't even try hitching and walked the road into town. Showered, washed all of my dirty clothes in the sink, and hung everything else up to dry. My drying gear is strung throughout the room like some sort of conspiracy theorist linking together bits of theory and evidence, but as long as I take it all down before I leave it'll be alright. Set the alarm this morning, a bit of a mind screw setting it an hour earlier than usual due to crosaing time zones. Packed up in the dark, managed to finish just as the sun was rising. Passed a tent I recognized real close to where I set up, hiker showed up late last night. He's usually an early starter, curious why he wasn't up yet I continued on. Gas station a few miles up the road provided a cold drinks, a water refill, and some charge for my electronics. Said hiker showed up a little after I did and I guessed right, he didn't know the time zone changed and set his alarm for an hour later. We walked for most of the day together in direct and hot sun along a relatively busy paved road. Fifteen miles in we stopped at a Dollar General just off trail to refill our water, and parted ways because he had an in for a hot shower and place to stay for the night. What a beautiful place the Econfina section is. Walked the rest of the day next to a narrow but fast moving river that has carved deeply into the earth. Walked on into the dark, just didn't feel finished yet when the sun went down. Might have to do with the time zone change. Camped tonight aside the river, the crickets and other bugs are chirping and making some pretty loud noise. Campsite is closed for construction but open to thru hikers, which is much appreciated since it's a weekend and there have been a large amount of people out and about today. Woke up a bit worse for the wear this morning, the hospitality shown to me last night was too much to turn down and we ended up talking and drinking late into the night. Walked slowly into the town of Bristol, stopping once at a local gas station with a hot grill for breakfast, continuing on a few more miles and getting a small amount of lunch later in the day. Whole day was on roads, until the last quarter of a mile. Hot day as well, mid 80's and a hot hot sun. Camped next to the engorged Chipola River this evening in the Wilderness Management Area withcthe same name. It's a wide, quick moving river whose banks are swollen with water, covering the trail in places. Should make tomorrow's hiking adventurous. Woke up in a pretty cruddy campsite, but I figured things out alright. Took my time, packed things up slowly, managed. A lot of dirt road walking today, much because the trail is pretty torn up in this part of the forest. Swampy areas with missing board walks, deep water and mud, but overall some pretty beautiful land. Around noon I arrived at a drive in campsite just on the edge of the National Park. They had outlets and showers, and the sun was shining high in the sky, so I plugged all my things in and grabbed a hot shower. Washed my hiking clothes in the shower as well and put them back on wet to air dry. Grounds keeper came over to check and see what I was up to, ended up chatting for a few minutes and giving me some doughnuts. Walked out of the park with little fanfare and hit the road. Next few days is going to include a lot of road walking, and while not my favorite it allows me to put in some good high mileage days. Walking towards town for the night my camping opportunities became less and less ideal, disappearing entirely with private property signs filling the gaps between homes. As the sun was setting I saw a woman on an ATV and asked her if she knew anywhere I could set up for the night, she kindly offered me up a spot on her land. As I was settling in for the evening her husband and son came looking to make sure I was alright, some tacos in hand. They invited me back to their house for more food and drinks and to sit inside. Ended up hanging and talking until well after midnight. Very nice people, another reason to return to this part of the world someday. What a long day. Woke up super tired, but did my best to shake it off, pack up, and get on my way. Had trouble finding a spot to camp last night. The one viable spot I ended up using turned into a boggy puddle overnight and left anything touching the floor of my tent a wet and soggy mess. Dried things off as best as I could and put them in my pack. Slow morning through Bradwell Bay. Shin to thigh deep mud and water for a few miles, with deep holes randomly throughout. A bit more exhausting than it should have been, might be coming down with something. After exiting the bay around noon, the few miles taking much longer than usual, I came upon a parking area at a road crossing. Unpacked all my stuff from last night and hung it to dry. Grabbed some water, ate lunch, relaxed for a bit. Rest of the day really drug on. Been in a sleepy/sick haze and was hoping to stop early but the last few miles were on a forest road with nowhere to pitch a tent. Arrived at the campsite to find it overgrown with plants and bushes similar to last night. Had a bit of a struggle setting up camp, but managed to get something to work. Here's hoping that a good night sleep is in the cards and I can shake this sickness off. Got up pretty early, set my alarm and was packed up and walking before the sun was up. After a mile of walking I came upon detour signage, trail through a really swampy area used to have a boardwalk which no longer exists. Luckily the road walk took me right past a dollar store which is perfect, because I wasn't quite sure how I was going to do my resupply for the next few days. While walking back to the trail I came upon a BBQ restaurant, so of course I stopped for a bite to eat. Had some sort of combo platter, it was pretty delicious. Rest of the afternoon was spent motoring towards Bradwell Bay, a wilderness area on national forest land. Very nice piece of land, loads of pines and cypresses intermixed. Was slowed down pretty hard the last two miles of the night, being dropped right into the middle of the bay. It's not a swamp per se, but there's definitely a lot of water here. It's as if someone had taken the standard forest floor of the area and added 10-12 inches of standing water all of a sudden. It's mucky, and muddy, with deep holes scattered throughout and slows you down pretty hard. Arrived at my destination, but am severely disappointed. It's a piece of dry land in a very wet area, which is great(! ), but it's so overgrown that there are so very few places to put a tent. Currently wedged in too close for comfort between a bunch of prickly bushes, thorny vines, and standing water. Goes to show that just because something is designated a "camping area" doesn't mean it's viable, especially in wilderness locations. Hit 800 miles today. Not sure if my shoes are going to make it. They're holdovers from the PCT, and while they already had some miles on them I figured I could stretch them for the whole trail down here. I estimate they have over 1100 miles on them currently, probably going to have to get a new set shipped out to me. Home stretch, really looking forward to getting back up to Maine and be home with my family. Woke up in a dark motel room, a bit off putting since I'm used to the sun waking me up. Cleaned up the room, packed, called the wife, and took a quick shower. Walked the mile into town and ran a few errands. Sent a few pieces of mail out, some extra gear I haven't used back home, a piece of defective gear back to the manufacturer. Grabbed groceries for the next day or two, spent some time at the local restaurant drinking coffee, an early lunch, and talking with one of the managers as I waited for a storm to pass. Bit of road walking out of town, a few miles up and around before being able to cross the river separating the two sections of the refuge in this area. Rest of the day was spent walking on soggy trail from the recent rains. Bumped into not one, but two hikers today. One a northbound hiker who started a week after me, another a southbound hiker who's been walking around the USA for almost a year. We all chatted on trail for a little bit and went on our separate ways. It's hard sometimes for me to not get all inside my own head, especially when I find out other hikers are moving quicker than I am. Most are younger, and their body's haven't sustained as much damage as mine has, but it takes some time for me to work it out in my mind. Did alright mileage wise today, even though I didn't leave town until after noon. Unfortunately the resupply options in St. Marks weren't very substantial, so I'm going to have to find some more food pretty soon, might involve a hitch. Camped tonight at the same site with the other NOBO hiker. Might not see him after tomorrow since he's moving a bit faster. Woke up before the sun, had an alarm set again to get me moving. Wanted to both see the sunrise from this location, and get into town early so I could figure out how I was going to get across the river that flows between the trail and the town of St. Marks. Exited the refuge around 1100, waited for an hour before calling a local fish camp for a lift across by boat. Due to many factors (weather, resupply, cost of a shuttle across the river, sore knee), I decided to spend the afternoon in town, renting a room at the fish camp for the night. Paid for the room and dumped my gear inside. Once everything was airing out in the room, I grabbed my empty pack and phoned the wife as I walked the mile back into town. Hit up the local dive restaurant for some hot food. Ordered some fried pickles and a blackened catfish sandwich. It was pretty delicious. Walked over to the local grocer but they're closed on Sunday's. Luckily the local marina had a small ship's store open, so I was able to grab a few frozen microwaveable dishes and some drinks for the night. Netflix as the rain came down outside, further validating my decision to spend the evening in town. Hiking out tomorrow after a quick resupply and a trip to the post office. Set an alarm for an hour before sunrise, definitely see the appeal. By the time you're packed up the sun is just coming up and you can kick off down the trail. Walked through the Aucilla Conservation Area all morning, a beautiful but ill maintained piece of land. 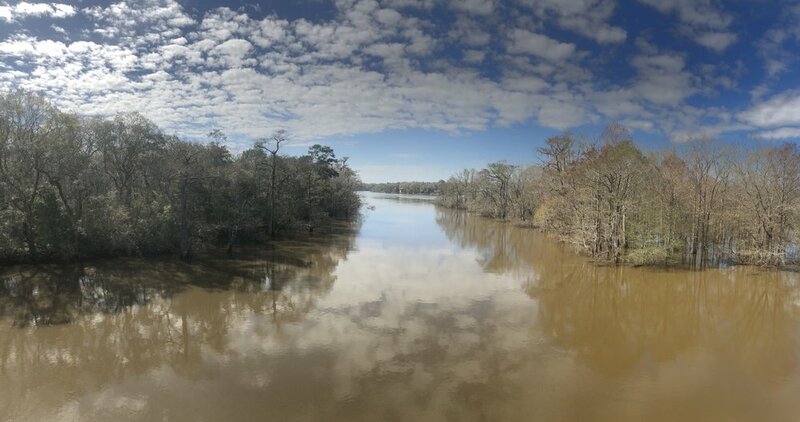 Mostly walked along the Aucilla River, a chocolate brown, slow moving molasses with swamps on either side feeding into it. Popped out a few miles from the St. Marks National Wildlife Refuge, a road walk connecting the two. Stopped in at JR's convenience store and gobbled down a few microwaveable hamburgers and breakfast sandwiches. Washed it down with a cherry coke, did a small amount of resupply shopping, charged my electronics, picked up a gear replacement package, and off I went. Have to carry my defective air mattress to the next town since there was no way for me to ship it out from the connivence store. NBD really, I'm not carrying much food since the next store is only one day of hiking away. Hiked the rest of the day on the NWR. Typical scenery until late into the evening where after the sun set into the Gulf of Mexico, the blue hour was just spectacular. Nothing but wide open plains, salt flats, ocean, tall grasses, and the occasional palm. Couple of more miles tomorrow on the refuge, then St. Marks. Probably going to spend the night there, once I figure out how I'm going to cross the quick moving tidal river without a hiker bridge over it. Guidebook says to hail down a passing boat - good thing it's a weekend. Woke up in the graveyard shortly before sunrise. Ate a box of Nilla wafers as I packed up. Another full day of road walking. Nothing exciting to report. More tiny, out in the middle of nowhere backwoods churches, loads of trailers and hunting camps, tons of posted signs, and innumerable loose dogs. Hope the FTA is able to get the past fifty miles off the roads - while not particularly dangerous because of traffic, it's pretty unsightly. Stopped for lunch at a little church made of cinderblocks. Filled up my water and had a chat with the wife as I munched on rehydrated minute rice. Ended up stopping early tonight, before the sun even went down. Not sure if it's because I haven't been using my my trekking poles on the roads, or that roads increase the impact on my joints, but I developed a pretty severe pain in one of my knees and some unusual aches in other places. I'll do my best to take it easy the next day or two, see how it goes. St. Marks in two days. Definitely in need of a proper resupply. Rough night last night. Between my air mattress deflating a few times, to the smell of manure being so strong it woke me up on multiple occasions, it was less than ideal. Set an alarm to wake up before sunrise due to the precarious nature of my tent site. While there were no posted signs, and I was tucked into the trees pretty well, I still didn't want to be woken up by someone knocking on my tent or yelling what I was doing there. Entire day of road walking today. Pretty uneventful for the morning, arrived at your stereotypical interstate exit ramp location. Gas stations on either side of the road and some fast food joints. Spent an hour and a half at McDonald's eating, charging, using the facilities. Left around noon with a full belly and a cup of sweet tea. Walked past a "Jellystone" themed Yogi Bear campground. I always thought Jellystone was in California, but I might just be confusing it with Yellowstone. Pleasant enough rest of the day, the road walk getting increasingly rural throughout. A bit discouraging to be walking on country roads and seeing nothing but fences and posted signs. And churches. Loads of churches. Passed something like four churches in ten miles today, with more along the road tomorrow. With little public land available on this stretch, I ended up in the way back corner of a cemetery's property. It's a pretty sizable plot with a lot of planned room for expansion, so there aren't any graves in the area, but I still can't help but think what would happen if the wrong type of southerner found me camped out here. Think I might have an infection on my thighs, similar to what I got on the PCT. It just occurred to me, I can't help but think it's related to my microfiber pack towel being a disgusting bacteria-ridden disease cloth. I don't wash it nearly enough, and I use it for a lot of tasks, from wiping down a wet tent to drying myself off after a rainstorm before getting into my sleeping clothes. If experience has taught me anything, time sure will tell!